The pneumatic stopper type G/L is used to plug temporarily circular pipes like pipelines and gas lines at relatively low pressures. This pneumatic stopper is made with synthetic fabric coated on both faces with oil resistant plastomers and PU; the elasticity of its diameter is such to allow a perfect sealing in the pipe. After its correct positioning into the pipeline, the stopper can be inflated with air or nitrogen through the flexible hose fitted with an inflating valve. 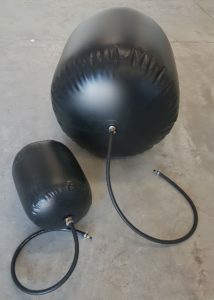 The pneumatic stopper type G/L, can be inflated with air or nitrogen and is made with synthetic fabric coated on both faces with oil resistant plastomers and PU. Its diameter increase is sufficient to guarantee the perfect sealing into the pipeline. The pneumatic stopper type G/L is suitable to plug temporarily circular section pipes like pipelines, gas lines at relatively low pressures.